As you read this, I am busy helping to build a community garden along with the Saturday6 and Troy-bilt in Miami, Florida. So, while I am “out of the office”, I thought that I would share with you links to the blog posts that are most often ‘clicked’ on. I hope you find them helpful and I promise to tell you about my trip when I get home! Why Do Cactus Have Spines? What Keeps a Landscape From Being Sustainable? Have you ever wondered how sustainable your landscape is? Earlier this week, we began our series of posts on sustainable landscaping and talked about what a sustainable landscape is. You can find the first post here. Most of us like the idea of having an attractive landscape without wasting resources such as fertilizer, excessive pruning and water, time and gasoline unnecessarily. But, oftentimes we do things in our gardens that create the need for additional resources. Today, we will look at one of the major problems that I see which often goes wrong and prevents people from having sustainable landscapes. Most people fail to take into consideration how large their new plants will grow. This young ‘Green Cloud’ Texas sage (Leucophyllum frutescens ‘Green Cloud’) measures roughly 1 foot high and wide. This ‘Rio Bravo’ sage (Leucophyllum langmaniae ‘Rio Bravo’), which is similar in size to ‘Green Cloud’ Texas sage reaches sizes up to 8 feet tall and wide. It’s hard to believe that such a small shrub can grow so much in just a few years time. This trailing rosemary was initially quite small when planted next to this boulder. However, the homeowner did not allow for the fact that the rosemary would grow and eventually ‘swallow’ the boulder. It will grow absolutely huge! This ficus tree absolutely dwarfs this house. At first glance, there appears to be nothing wrong with this landscape area. There are some larger dwarf oleanders in the background and nine young Texas sage shrubs. But, do you think that the Texas sage shrubs will fit in this area once they start to grow toward their mature size of 6 – 8 feet? Over-planting occurs when people don’t allow for the mature size of the plants. Of course, new plants look rather small and somewhat straggly once first planted, which often leads to over-planting to make the new area look more attractive. Would you believe that the shrubs planted above are actually the same as those shown below? It’s true. The only difference is that in this space, the mature size of the shrubs was taken into account, so there was no over-planting taking place. Think about how much less money and maintenance this area uses compared to the previous area? There are fewer plants, less maintenance and it looks much nicer! So, what do you think people do if their plants are planted to closely together – they prune them…a lot! Drive-thru’s are places that you can usually find over-planted landscapes. The one above is filled with 2/3’s more plant material then is needed. The over-pruned shrubs in the forefront are actually Valentine (Eremophila maculata ‘Valentine’) shrubs, which look much more attractive when not over-pruned. There are 3 Valentine shrubs in the photo above that are allowed to grow to their natural shape after their annual pruning in May. These silver sage shrubs at our local Costco store have also been over-pruned due to the fact that they were planted too closely together. Here are some interesting facts about over-pruning that you may be surprised to hear. – uses more water (in their attempt to re-grow lost leaves pruned away). – leads to unhealthy plants (from the stresses of too much pruning). – wastes time used for un-needed pruning. Have you ever seen the inside of shrubs that have been excessively pruned for years? Not too pretty, is it? Over time, flowering shrubs that have been excessively sheared, can develop large dead areas and eventually decline. This leads to old shrubs being removed and a new ones put in. Growing plants that aren’t adapted to your climate. Plants that are not well-adapted to your local climate require excessive resources such as extra water, fertilizer and other maintenance. Queen palms (Syagrus romanzoffianum) are just one example of a plant that often struggles in our southwestern, desert climate. No matter what we do, they will never look as nice as the queen palms growing in more tropical climates. The lesson to be learned from this is that not planning for the mature plant size, over-planting, over-pruning and wrong plant selection uses up a lot of resources. 1. Excessive amounts of water are used due to over-planting, over-pruning and for plants not well-adapted to our arid climate. 2. Money is wasted on buying more plants then are needed. 3. The costs of maintenance used for excessive planting and pruning include another resource – gasoline. 4. Declining health of plants that have not been pruned properly or those ill-suited for our dry, hot climate. So how does your landscape compare with examples, above? If you see some similarities – don’t worry. There are things that you can do to decrease the amount of resources that go into maintaining your landscape. My goal is to help you toward not only a more sustainable landscape, but one that is also beautiful and attractive. “Small Steps Toward a Sustainable Landscape”. https://www.azplantlady.com/wp-content/uploads/2014/02/Picture-001.jpg 883 1600 arizonaplantlady@gmail.com http://www.azplantlady.com/wp-content/uploads/2018/10/favicon.png arizonaplantlady@gmail.com2014-02-05 20:42:002016-10-26 14:36:00What Keeps a Landscape From Being Sustainable? This past week, I have been sharing with you my latest landscape project that is located next to a golf course. I shared with you the tree and shrubs that I had chosen and not it’s time to show you what perennials and succulents that will be going in. *All the following perennials are drought tolerant and require full sun with well-drained soil. Damianita (Chrysactinia mexicana) is a fabulous flowering ground cover. It thrives in locations with hot, reflected heat and handles cold temperatures (down to 0 degrees F) just as well. In spring and again in fall, masses of bright yellow flowers cover this low-growing perennial. When not in bloom, it has dark green needle-like foliage. Newly planted landscape with Purple Trailing Lantana, Parry’s Penstemon, Desert Spoon, Palo Blanco trees and Damianita. I have used Damianita in other landscapes that I have designed in the past (shown above), with great results. *The trick to keeping Damianita looking great is to shear it back in late spring. 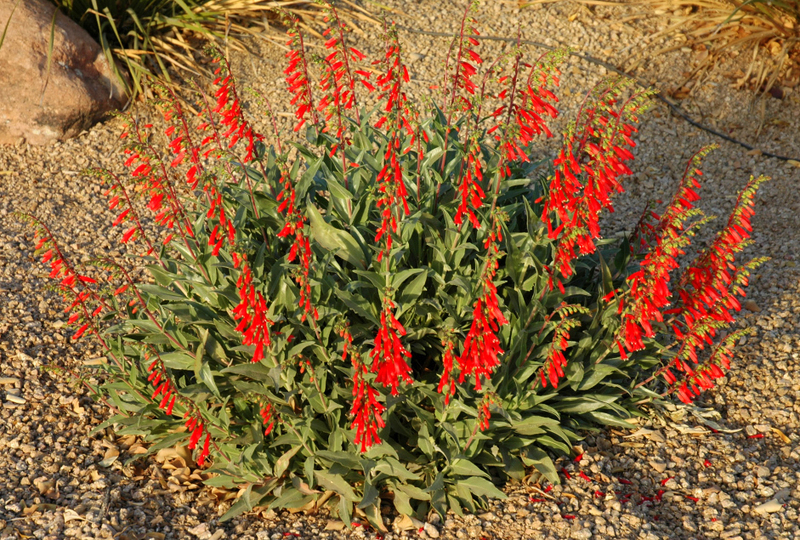 Firecracker Penstemon (Penstemon eatoni) is my favorite flowering perennial. The one pictured above, is in my own garden. I am often asked about this brilliantly colored plant in spring when it is in bloom. One of the reasons that I love this Penstemon is that is begins flowering in winter, in zone 9b and continues on into spring. 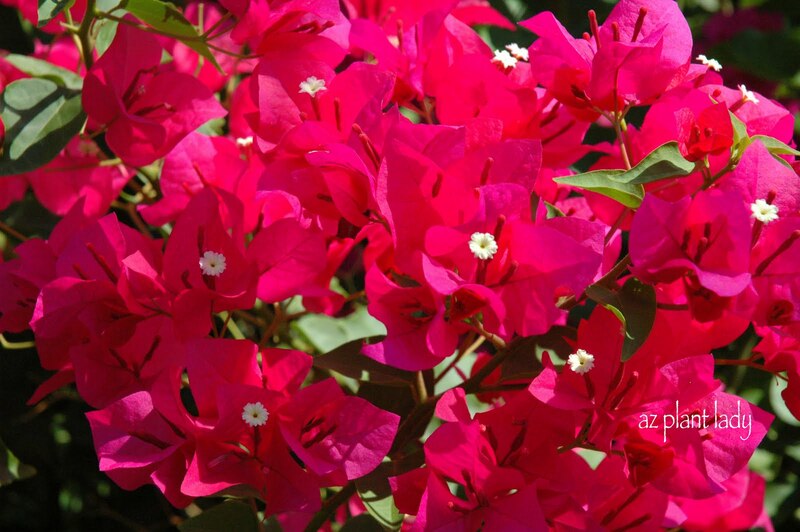 In cooler zones, it begins flowering in spring and lasts into summer. It handles cold temperatures easily and is hardy to zone 5. Hummingbirds find the flowers irresistible. To prolong bloom, prune off the flowering stalks once the flowers begin to fade and you will be rewarded with another flush of bloom. Angelita Daisies (Tetraneuris acaulis formerly, Hymenoxys acaulis) are what you could call one of my ‘signature’ plants, because I use them often, like the landscape I designed, above. I find them invaluable in the landscape because they flower off and on throughout the year, with the heaviest bloom occurring in spring. They easily handle full sun and reflected heat and look great in pots. I like to plant them next to boulders in groups of 3 or 5 for best effect. Cold temperatures are no problem either because they are hardy to zone 5. Maintenance is easy – simply shear the flowers every 8 weeks or so. Now, so far I have shown you the trees, shrubs and perennials planned for this area. But, I want to add succulent plants, which are also used as accent plants. These types of plants add texture to the landscape because their unique shapes contrast well with the softer, more rounded shapes of the shrubs and perennials. Weber’s Agave (Agave weberi) is a large agave that can grow 5 to 6 ft. high and up to 8 ft. wide. In large landscape areas, I don’t want to use small succulents because it will be hard to see them unless you mass a lot of them together. My budget won’t allow for that with this project. I love how this large agave can stand up on its own. I like to plant flowering ground covers underneath them. Plant in full sun or light shade. Weber’s Agave is hardy to zone 7. *Agave need supplemental water in our climate to look their best. I recommend watering twice a month in summer and once a month in spring and fall. You can’t get much more unique in shape and coloring then Purple Prickly Pear (Opuntia santa-rita). I love the gray pads with shades of purple. The purple color deepens in cold temperatures or in times of drought. In spring, yellow flowers cover this beautiful cactus. Hardy to zone 8, plant in full sun and well-drained soil. **If you notice white cottony masses on your prickly pear, simply spray it off with a hose. They are caused by an insect. Okay, are you ready for my last plant selection for this new project? It is hard to find a succulent that works harder then Red Yucca (Hesperaloe parviflora). Despite their common name, they aren’t a yucca. The lower, succulent leaves resemble ornamental grasses. In spring coral-colored flowers are borne above the grass-like foliage. Hardy to zone 7, Red Yucca thrives in full sun. While drought-tolerant, they do best with supplemental water. Maintenance is easy – just remove the flowering stalks as they begin to fade. *There is a common mistake that landscapers often make with this succulent plant. To make sure this doesn’t happen to you, check out my previous post, “Do This NOT That”. I will use boulders interspersed throughout this flat area to add height. 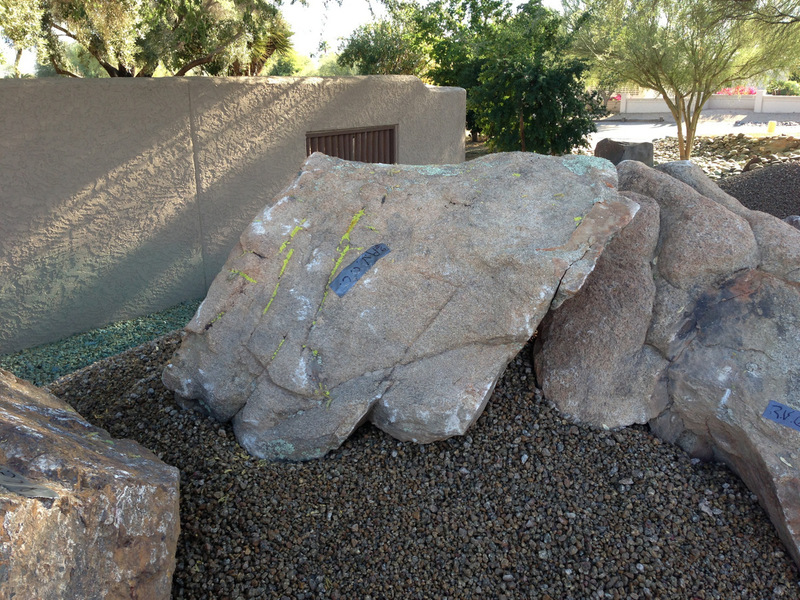 The boulders will have either a succulent and/or flowering perennials planted next to them. Well, I must say that I am excited to get started on this project. We will wait until this fall for the planting. I’ll be sure to take you all along as it progresses. 7 days until my daughter, Rachele, comes home from the Navy!!! In my last post “A Long Forgotten Area Ready for Transformation”, I told you that I would share what plants I was going to have put in this neglected area. – I have grown them myself in either my home garden and/or in landscapes I have managed. – They are relatively low-maintenance. – The plant palette will also ensure year round color, with at least one or more plants being in bloom at a given time. So are you ready to see what I chose? The area has two large Foothills Palo Verde trees along with a Wolfberry tree, so I chose one other type of tree to add. Desert Willow (Chilopsis linearis) is one of my favorite desert trees. It is not a true willow, but is named for the fact that its leaves are willow-shaped. Colorful flowers appear throughout the summer that add a vibrant punch of color to the landscape. 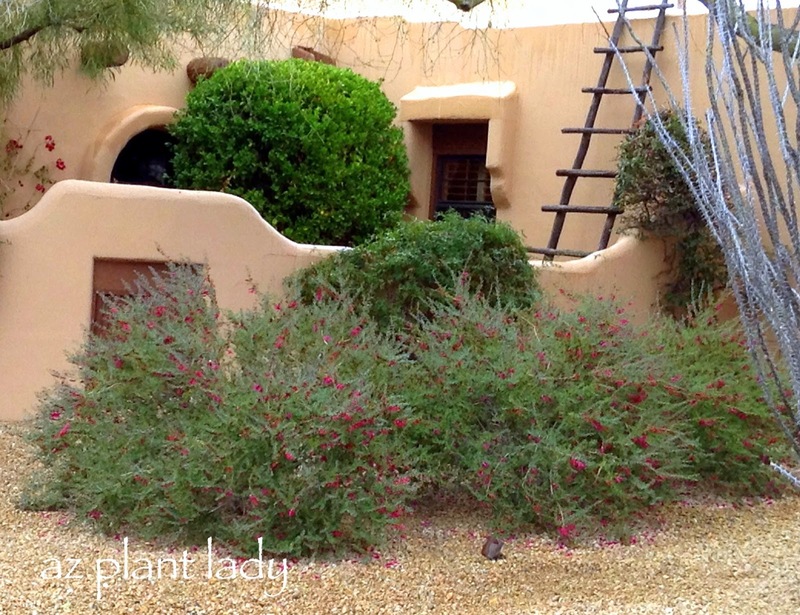 Hardy to zone 6, Desert Willow requires well-drained soil and full sun or filtered shade. For more information on Desert Willow along with the different varieties available, check out my Houzz article about this lovely tree. 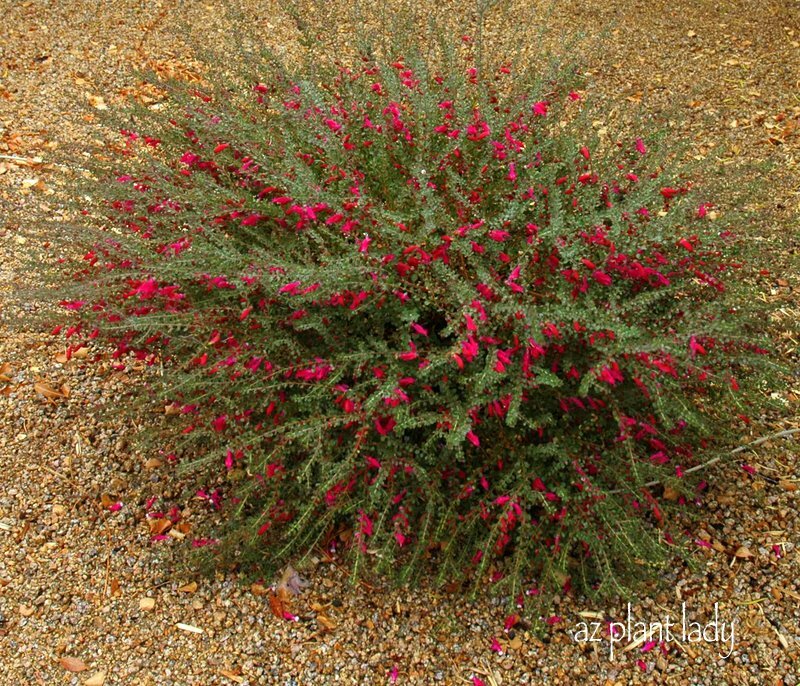 Valentine Bush (Eremophila maculata ‘Valentine’) is my favorite shrub of all time. I will never forget the day when I was first introduced to this red-flowering shrub, by Mountain States Wholesale Nursery. It was 1999 and I was a horticulturist fresh out of college. I was given 2 Valentine shrubs from Mountain States to plant in the landscape area I managed. Ever since then, I have been hooked. Red flowers appear on this shrub, beginning in January and lasting until April. If you haven’t noticed it before, there isn’t much blooming in winter, which is one of the reasons I love Valentine. The foliage is evergreen and Valentine are hardy to zone 8. Better yet, they only need to be pruned once a year – in spring after flowering. Plant in full sun and well-drained soil. For more information about Valentine, check out my post about this great plant. 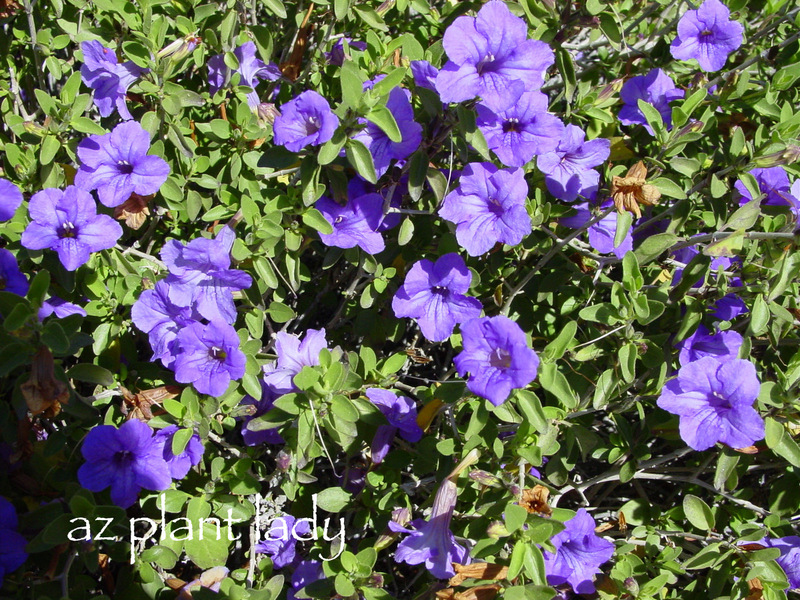 My second choice for shrubs is Baja Ruellia (Ruellia peninsularis). Baja Ruellia is what I like to think of as a smaller version of Texas Sage species (Leucophyllum sp). It doesn’t get as large and has a longer flowering season then Leucophyllum. 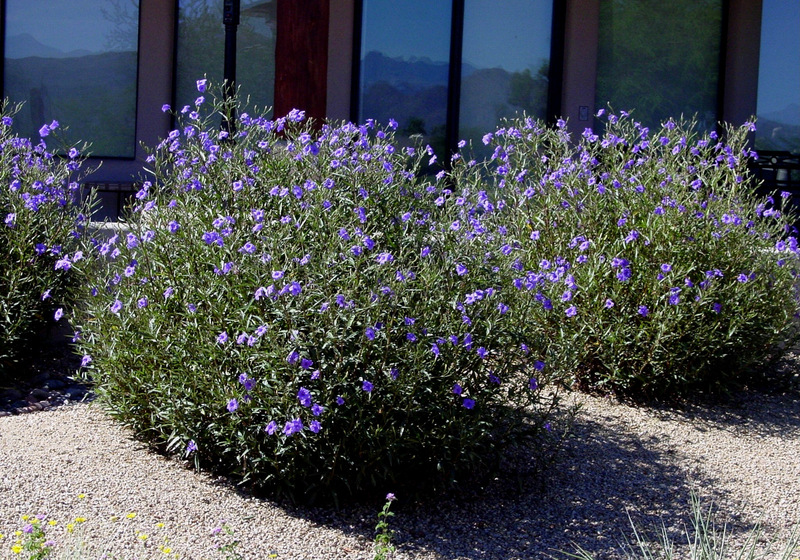 The flowers of Baja Ruellia are tubular and appear spring through fall, with the heaviest bloom occurring in spring. The foliage is light green and rarely suffers frost damage in our zone 9b climate. 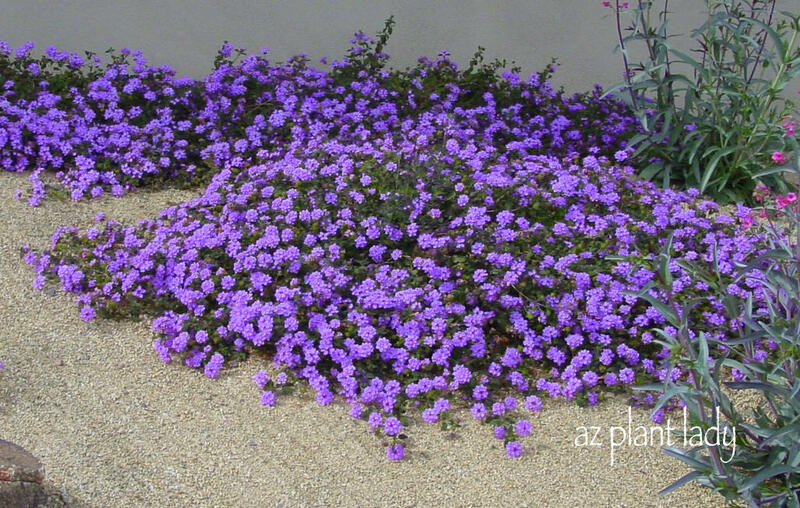 Hardy to zone 9, Baja Ruellia should be planted in full sun and well-drained soil. The third shrub for this area will be Silvery Cassia (Senna phyllodenia). This Australian native does very well in arid landscapes. The silvery foliage will provide contrast to the darker greens present in the landscape. Evergreen to 20 degrees, this shrub flourishes in zone 9 landscapes. Yellow flowers appear in late winter and into spring. Pruning is needed after flowering, to remove seed pods in managed landscapes. Like the other shrubs, Silvery Cassia enjoys full sun and well-drained soil. 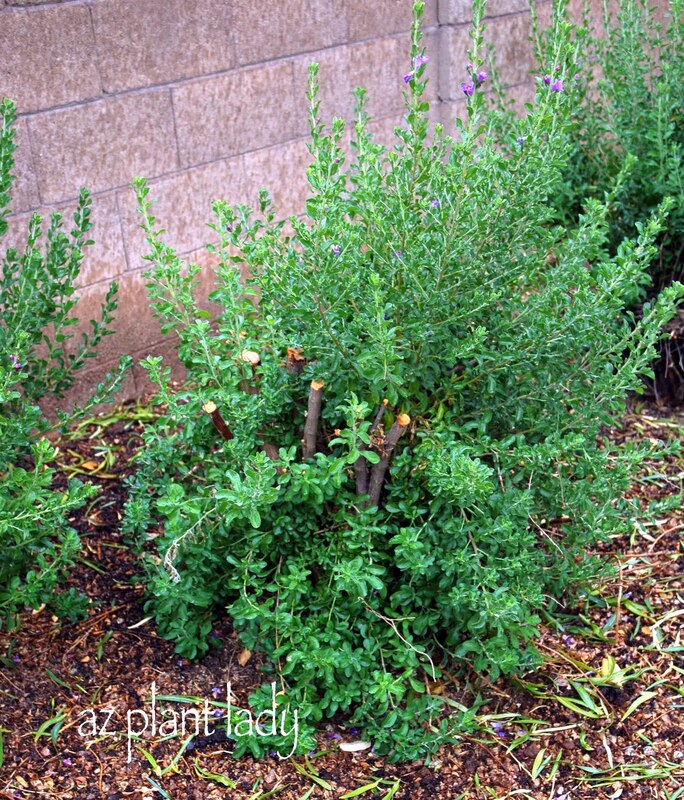 The smallest shrub for this area will be Autumn Sage (Salvia greggii). This plant is hard to zone 7, so remains evergreen during winter here. Flowers appear fall through spring in the low desert. The most common colors are red or pink, although there are other colors such as white, lavender and peach. I like to use Autumn Sage around trees like Palo Verde, where the filtered shade shelters it from the intense summer sun. I first saw them planted around a tree at the Desert Botanical Garden and I really liked the way it looked, so I have repeated this design in many of my landscapes. The Autumn Sage above, was planted by me around a Foothills Palo Verde about 12 years ago and they are still going strong. I still have perennials and accent plants to show you that I have included in the design and I’ll share them with you next time. Life around our household has been busy lately…. My son Kai, has ditched his wheelchair for a walker and will soon be able to walk without it. My daughter, will soon come home after leaving 5 months ago for the Navy. She is graduating from her Equipment Operator School next week and will be an official ‘SeaBee’. She will be on leave for 2 weeks before she reports for combat training in Mississippi, where she will be stationed for a month. The BEST news is that her permanent base will be in Port Hueneme, which is where she wanted to be. What is even better for us, is that it is in Southern California, just 7 hours from home!!! The other evening, my husband and I got away for a few hours to go and see a movie. On our way, we stopped by for dinner at El Pollo Loco. As we were leaving, I looked toward the drive-thru and saw numerous Valentine (Eremophila maculata ‘Valentine’) shrubs. As you can see, the shrubs are planted very closely together, so they do not have room to grow to their natural size. So, landscapers come in and prune away the attractive natural shape of these shrubs along with their colorful, winter flowers. The problem with this area is over planting. You can really see it on the other side of the drive-thru lane. Often, landscape architects and designers add more plants then needed because when first planted, plants look scrawny and small. Not necessarily something their client wants to see. They want immediate impact from plants. But, just 2 years later, you have unattractive green blobs because there just isn’t enough room for them to grow and they require frequent visits from the landscaper. So, what can be done? Well, if I were managing this property – I would pull out every other shrub in order to allow the remaining shrubs more room to grow. This not only will create a more attractive landscape, but one that requires less maintenance, thereby saving money. Valentine shrubs need to be pruned once a year in May. Prune them back to 1 – 2 ft. wide and tall and you are done for the year. Have you experienced a warmer then normal winter this year? I certainly have, although I’m not complaining because my garden loves it. I took a walk around the garden and was so pleased to see quite a few plants blooming…. My purple lilac vine blooms this time every year, which makes it a great vine for the garden. The foliage is evergreen in my zone 9a garden through out the year, which is also a plus. It can be hard to find this flowering vine in the nursery later in the year. So, grab it now if you want one. 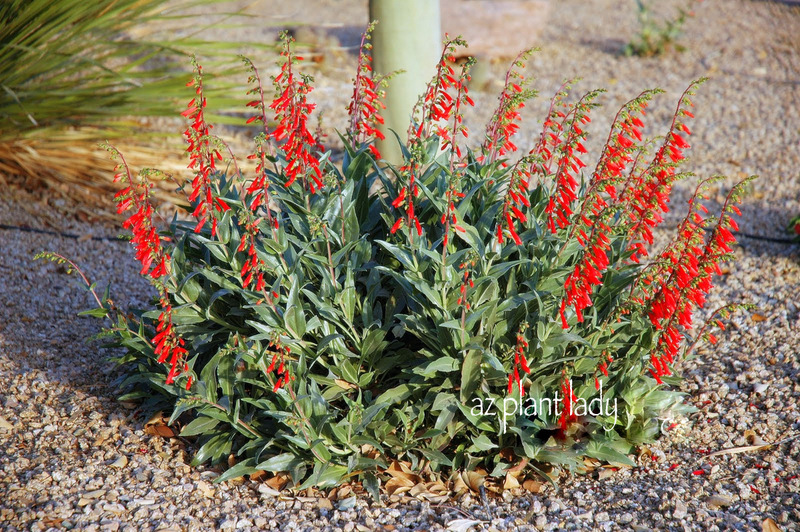 Firecracker penstemon is my favorite plant. I starts blooming in January and goes until May. Hummingbirds love it too! My pink beauty shrub has grown tall 8 ft.), which I love because it covers an expanse of bare wall in the garden. This Australian native is evergreen in my garden. This is my second favorite plant. Valentine flowers from December through May in my garden, with the peak bloom arriving on Valentine’s Day! Hardy to zone 8. Normally, my purple trailing lantana is brown and crispy from frost – but not this year. Butterflies just love this plant. My pink trumpet vine blooms next to my vegetable garden. I just love this plant too! How about you? Do you have anything blooming in your garden this month? 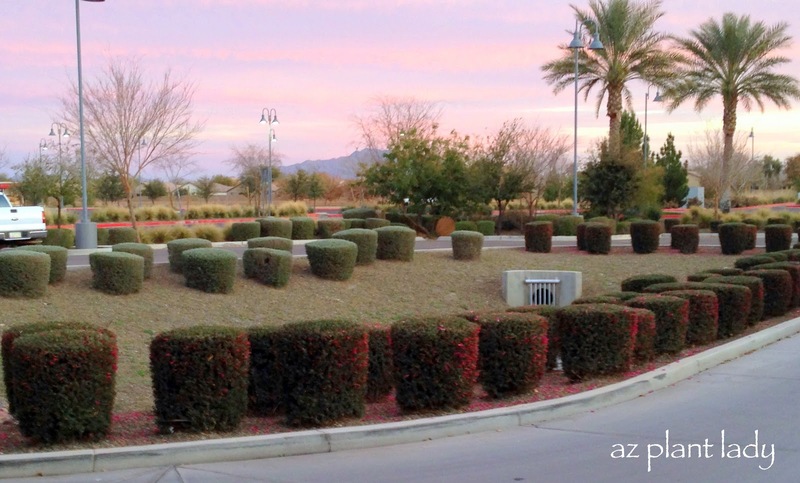 Many people tell me that they are tired of their boring, round green shrubs. Often, they are surprised when I tell them that those ‘boring’ green balls would actually flower if given a chance. So, how do you take those boring green balls and turn them into beautiful, flowering shrubs? The first step is to rejuvenate your green ‘balls’ by severely pruning them back. Now I warn you, this is an ugly stage. Your shrubs will look like a bunch of sticks poking out of the ground. Red Bird-of-Paradise shrubs, newly pruned. This is best done at certain times of the year, depending on what type of flowering shrub you have. For example, if you severely prune summer-flowering shrubs back in December, you will have to wait a long time for them to leaf out, once the weather warms. I pruned the ‘Rio Bravo’ Sage (Leucophyllum langmaniae ‘Rio Bravo’) shrub below in March and by early April, it had already begun to produce new branches. ‘Rio Bravo’ Sage, 1 month after severely pruning. So, when should you prune your shrubs? Here is a list of some of the most common shrubs in the low desert and when they should be pruned. If you look closely at the list above, you can see that in most cases these shrubs are either pruned once they have finished flowering OR just after the danger of frost is over in the spring. 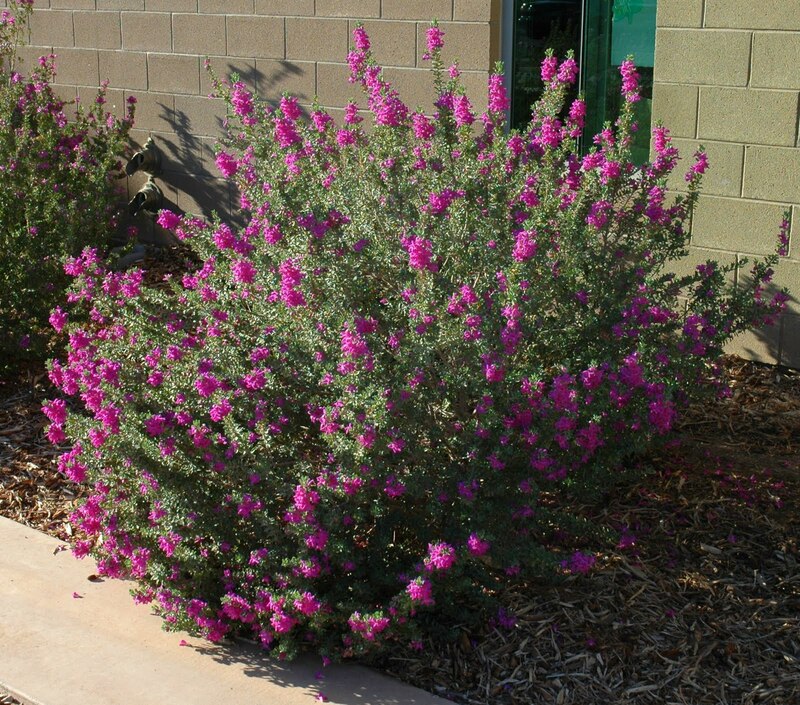 The reward for your efforts is a beautiful, flowering shrub like the ‘Green Cloud’ Texas Sage, below. If your shrub is getting a bit large later in the year, you can prune it using hand pruners and removing no more then 1/3 of the growth. Just be careful not to use hedge-trimmers. So, do you have to prune your flowering shrubs severely every year? As long as your shrub is attractive and not outgrowing its space, you can save severe pruning for every 3 years or so, which will remove older branches and cause new ones to grow in their place. This is what I do in my own garden. 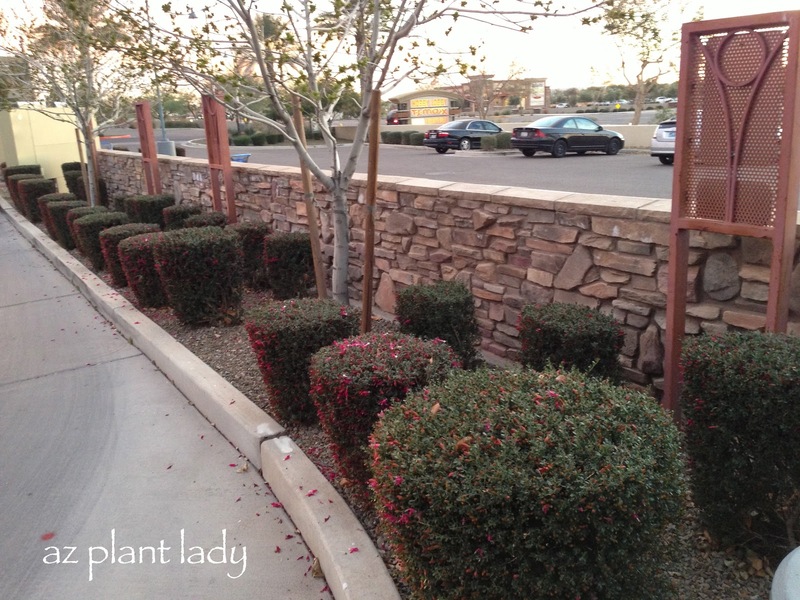 Now for those of you who really like the appearance of formally pruned shrubs…. Don’t worry – there is hope. There are some types of shrubs that do very well when formally pruned. When you describe yourself, do you think of yourself as a trendsetter? Do you wear the most current fashions or drive the newest style of car? Well, anyone who knows me well, would not use the word trendsetter to describe me. Now that doesn’t mean that my clothing or car are out of style…..I am perfectly content being more ‘middle of the road’ in my tastes. My youngest sister is what you would call a trendsetter and I am always getting inspiration from her in terms of my fashion sense, books to read and so much more. However, before you write me off as a trendsetter, there is one area in my life where I do like to be a trendsetter…..in the garden. If you drive down any neighborhood where you live, you probably find the same types of plants in the front yard. In a given neighborhood, there can be a very limited variety of plants present. This can be a result of the home builder designing and installing the landscape, using a limited amount of plants to choose from. Or, that the homeowners do not know that there are other plants available for them to use. 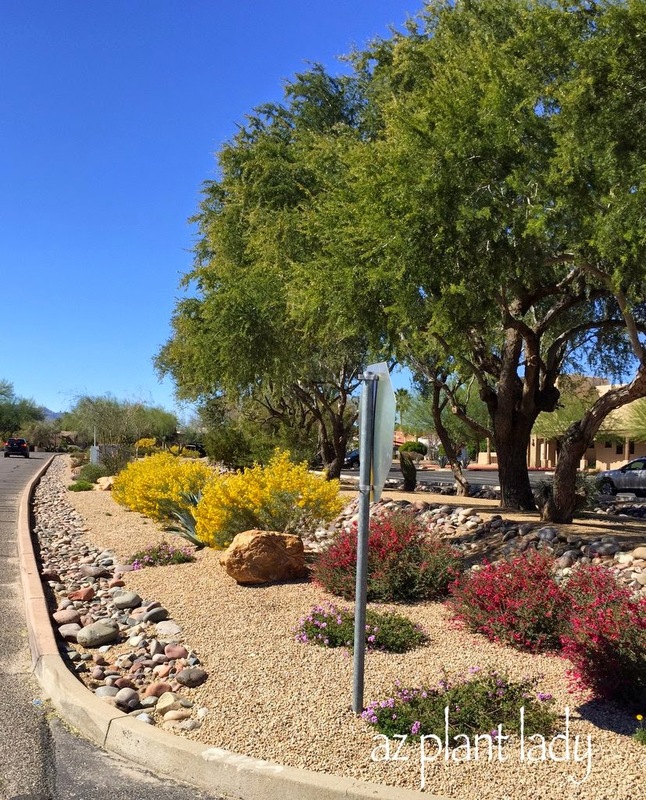 In my little corner of the desert Southwest, you will see a large amount of Lantana, Dwarf Oleander, Texas Sage, Bougainvillea and Ficus trees. Now there is nothing wrong with these plants and they look fabulous in the warmer months. But, when so many people have these plants in their front yard, they tend to become boring. The plants actually tend to become part of the background and do not add much interest to the landscape. Imagine if everyone wore the same 4 pieces of clothing. It would be pretty boring. But, imagine if one of those people decided to spice up her wardrobe by putting on a different style and color shirt? You can bet that people would start to notice her. Well, the same is true of your garden. There are many different types of plants that are just as beautiful as the more common ones found in your neighborhood. Over the next few posts, I will show you some of my favorites. Today, I will introduce you to one of my favorite shrubs. This shrub was introduced by Mountain States Wholesale Nursery. Aren’t the flowers beautiful? This is my Valentine shrub (Eremophila maculata ‘Valentine). Over 12 years ago, I remember my nursery sales representative bringing me some free shrubs to try out on the golf course I was working at. Well anytime anyone offered me free plants, I was more then happy to try them out. Well, they turned out to be the best thing I had ever planted and I was soon ordering more. Beautiful flowers are produced during the winter months, when there is not much going on in the garden. It only needs to be pruned once a year – in May. I never had to fertilize them. Hardy to 15 degrees F.
(Even when temperatures dipped down to 21 degrees last week, my shrubs are still beautiful and flowering). Grows approximately 5′ x 5′ in size. and does best in full sun. I mean, what more can you ask for in a plant? So what are you waiting for? Go to your local nursery and pick some up. I have even seen them at our local big box stores.